Home » Aligning to Standards » Definitions, definitions… What does it all mean? Definitions, definitions… What does it all mean? 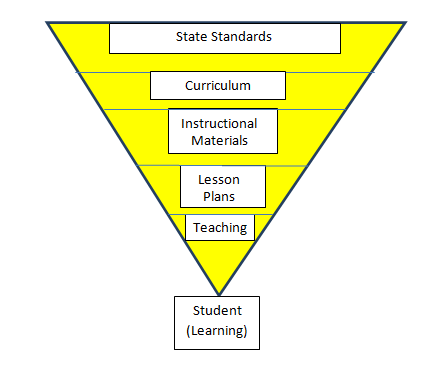 Are you confused about the difference between standards, curriculum, instructional materials and lesson plans? Well, you’re not alone. At Learning List, we often hear educators and publishers confuse the terms. Hopefully this will help you distinguish their meaning and, more importantly, understand how each is an invaluable component in helping students learn. State Standards are the state’s pronouncement of what students should know and be able to do after completing each course. Curriculum sets out what the district will teach. It contains the standards and defines when each standard will be taught and when students will be tested to measure their mastery of the standards. Districts develop their own curriculum or use a commercially available curriculum aligned to state standards. Instructional materials (IMs) include textbooks and online resources that reinforce and/or provide instruction. IMs should be “aligned” to the standards, meaning they should teach what the standards require students to know and be able to do, in order to prepare students to be successful on state and district assessments as well as have a strong foundation for the next year’s curriculum. Lesson plans are the teacher’s instructional plans for how they will teach the standards and what the students will do to demonstrate mastery of each standard. Teachers may develop their own lesson plans, drawing from multiple resources, or follow explicit instructional plans from the campus or district level.